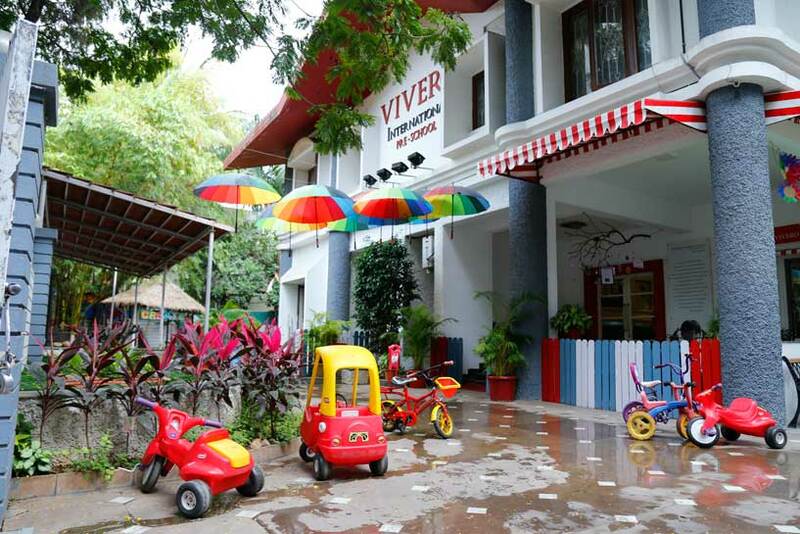 Vivero International Pre-school & Child Care, Kalyani Nagar is nestled in 10,000 sq.ft. of safe and secure environment. It caters to the needs of children between the age group of one and a half to six across five grade levels. We are inspired by the Reggio Emilia Approach and believe that environment is the third teacher. Our outdoor and indoor spaces are conducive in encouraging children to inquire, think and learn. Children have access to various activities throughout the day. The Atelier of light never ceases to fascinate them. Our Reggio inspired environment is created by out Atelierista. Children work and explore various materials and textures to create art projects. Our teachers consistently observe children to understand their needs and monitor their progress. Our teachers are researchers and believe in the pedagogy of listening. Classroom displays include children’s original artwork, among other examples of their work. Children learn numbers and the alphabet in the context of everyday experiences. Meaningful activities like cooking, taking attendance, or weekend recount provide the basis for learning activities. Children are encouraged to understand appreciate and create music and to express themselves through murals or pottery in our outdoor spaces. Children are encouraged to read books from their class bookshelf and their teacher reads one to them every day. We share a positive and open relationship with families. We partner with parents to optimize their child’s learning. We live up to the meaning of the word Vivero – a place where life is nurtured. Nazura is an experienced Educator and Parental Coach having worked with children and parents for more than 20 yrs. Her journey has been enriching and full of learning as she has been actively involved with children, Educators and Parents through various creative endeavours, skill development programs, and leadership programs. She has a wide exposure in conducting Parenting Programs & Educator Training Programs. She strongly believes in the theory of Emotional Intelligence. Over the years she has seen the growth of young children and their evolving journeys with their change agents namely Educators and Parents. She is passionate about young children and believes in them as knowledge constructivists and thinkers. She definitely considers Educators to have a great influence on the learning process of a child and hence believes in them being facilitators. Nazura passionately believes in ‘The Image of The Child’ which determines our responses and relationship that we share with young children in the capacity of an Educator or as a Parent.